Will these little sticks one day be the backbone of your PCs storage? We hope so! A quick look through the bus speeds and data rates available in a PC system soon tells you where there is a bottleneck: it's your hard drive. All over the board data is being shifted in gigabytes per second, but the hard drive is still doing it in megabytes. Theoretical speeds aside, what you're probably getting is 50 to 70MB/s, tops, and you'll have to wait while it finds the data in the first place. Hard drives have been a fundamental part of the PC for yonks. The interface has changed and capacities and speeds have marched ever onwards, but essentially its pretty much the same device that graced IBM's new-fangled computer things in 1956. Every time it appeared as if the edge of the technology had been reached, some development or other comes along to push it further. Giant magnetoresistance heads, often cited as the first practical application of nanotechnology, came along in 2000 (and won its inventors the Nobel Prize). In 2005, we got perpendicular recording (the magnetic regions are arranged vertically rather than end to end). All this engineering effort meant for years now data densities on the platter where growing by 100 per cent a year, without prices doing the same. Now a typical drive of 500GB or 1TB costs about £50, give or take. All well and good but capacity ain't everything and, fast as they are, the traditional hard disk drive has a basic design, which simply cannot be made to run at the sorts of speeds the rest of your system can cope with. If sheer capacity is paramount then ye olde hard drive reigns supreme. For oomph it is time to move on. Enter the cocky solid state drive to step all over the old guard, sporting no moving parts and access times a spinning disc could only dream of. From its origins in server and racks, through USB keys, we now have solid state drives that plug straight into SATA, so you can simply plug them in and off you trot. Instead of all that moving about gubbins you've a mass of non-volatile NAND flash memory. Great stuff, problem solved. SSDs are excellent at random reads, there's no disc head to position, it'll run a hundred times faster than its mechanical cousin with random access times of about a tenth of a millisecond versus up to 10 milli-seconds. Sequential reads run at 150 to 200MB/s, double or more that of a typical HHD. Sequential write isn't quite as impressive (more like half that of early drives but getting better now), it takes a 10,000rpm HDD drive to put up any competition here. Rather surprisingly though, it transpires that solid state drives wear out. The floating-gate transistors can only stand so many read-write cycles: 100,000 is typically quoted. Sounds like a lot but that's not quite as much as you might think, given the number of writes made during a few hours browsing. Don't be too scared of the limited life though, drives sold with a guaranteed 100,000 cycle life means that nearly all the little fellows will last considerably longer. Clever jiggery-pokery with the controller helps spread and minimise the load and patch over any errors too. True, it won't last forever, but this is PC technology we are talking about. Capacities fall a long way short of HDD and prices per GB remain daunting: Around £100 currently secures 64GB - sufficient for a Windows installation, an application or two and some data to play about with, but that's it. You can always use a big fat hard drive as an adjunct if you insist on going mad and having loads of films, music and games on your PC (you crazy fool). However this means two drives where we really want one. 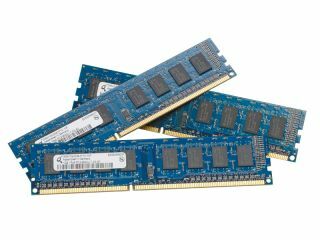 Even with larger capacities and lower prices, SSD still doesn't write fast enough and however clever you are controlling it, the NAND memory currently has a limited life.